I cannot count my day complete til needle, thread, and fabric meet…. Good morning, my dear friends. The heading of this blog really struck home with me. If I don’t have the opportunity to stitch daily, I find some time, at a minimum, to at least THINK about stitching….what will my next project be, what will I design next, what colors and types of threads will I use, which fabric, what will be gifts for loved ones, and the list goes on and on and on…. I guess one could say that I am obsessed with this art. I admit that is true, otherwise, I wouldn’t take away from valuable stitching time to write this blog, encouraging you to pick up a needle and give it a try. It is that important to me. I hope as I stitch that I am creating future heirlooms for my family to cherish long after I am gone. Organization is key to prevent yourself from being frustrated as you stitch. One of the things that I struggled with were my needles. I had a hard time keeping my needles organized. I misplaced them, I forget what needle I used on what material, and, oh, where did I put that tiny little beading needle? BUT, fellow stitchers, there is a solution for this! It’s called a needle book and I stumbled across this really lovely one. This is called Button, Button by With Thy Needle and Thread. When it is opened, you will find, soft fabric pages for you to store and arrange your needles. Isn’t it beautiful and so practical? The other thing I think is important is to make sure you have the right tools. Don’t try to cut your beautiful threads with your kitchen shears. 😉 Buy yourself some FUN embroidery scissors. There are many choices out there. This happens to be the one that I chose. Look closely in the center and you will see a little rabbit. I think they are so sweet and make me smile. 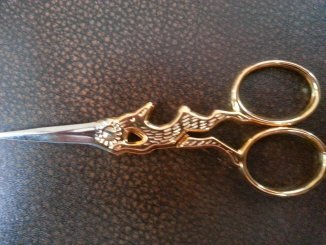 I have a collection of embroidery scissors but these are the ones that I reach for first. 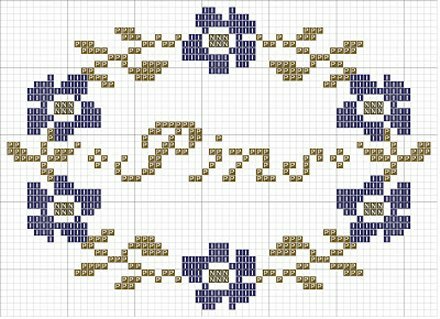 And because I am writing about staying organized, I am giving you a pattern to make a Pin Keep (pincushion), courtesy of Threadwork Primitives. I am including the colors called for by the designer, but you can make it your own by using whatever colors work for your decor. 🙂 Hope you like it. And that’s what this is all about. Smiling, enjoying what you are doing, and filling that creative void that most of us stitchers have. As always, be kind to each other. Peace and all good things.